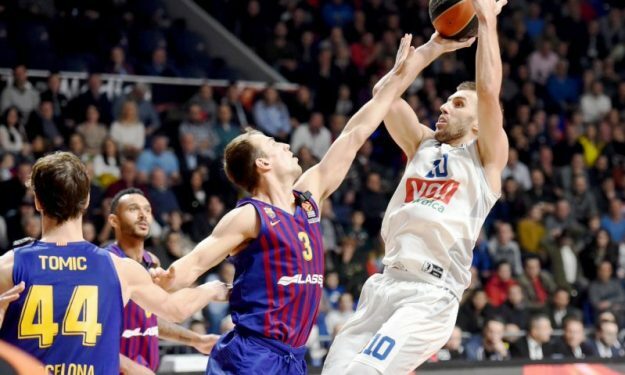 In a defensive-minded game that was decided in the final minutes, Buducnost took down Barcelona in Day 11 of the Turkish Airlines EuroLeague competition. After defeating CSKA Moscow in Podgorica, Montenegro, Buducnost VOLI picked up another impressive victory against FC Barcelona Lassa, 67-64 to improve to 3-8 on the year and win its third straight home game. The game was decided in the final two minutes of regulation, as after 37′, the teams were tied at 59. Generally, throughout the four quarters of the contest, no team managed to go up by double-digits. Nemanja Godric was the difference for the hosts. His back-to-back three-pointers put the hosts in the driving seat, 62-59. Barcelona missed three straight possessions, as Earl Clark came up with a huge defensive play, and on the other end, scored with Edwin Jackson’s first field goal (64-59). And while Clark rejected Kevin Pangos with 25 seconds remaining, Godric’s foul sent Chris Singleton to the free-throw line, and he made it a one-point game, 65-64. On the other end, Jackson made both free throws for the hosts and at the buzzer, Hanga’s shot to force overtime was off. Clark also affected the game to a large extent, with his defensive presence, three blocks, and 12 points. Minutes after the end of the game, Aleksandar Dzikic was overload by the emotions, but remained humble: “We were just lucky. They were the better team. We just jumped them a little bit. Every game is tough in the EuroLeague. We beat Barcelona, but I’m tired and not fully aware of what we just did,” he said. The 30-year old, Godric was crucial for the winners, especially down the stretch. Godric finished the game with 15 points and four rebounds, but his clutch plays in the fourth quarter made the difference. Both teams were struggling with their three-point shots in the first quarter, combining for just 1/15. Eventually, Barcelona with Thomas Huertel’s buzzer-beating lay-up led by a single point, 14-15. The hosts competed excellently with Barca in the first half, playing tight defense and holding the opposition to just 33 first-half points. At the break, Svetislav Pesic’s squad led by two, in a low-scoring affair (31-33). Adam Hanga was making plays on both ends of the court for the visitors, but mid-third quarter, the Spanish team could not take advantage of Hanga’s plays nor Buducnost’s turnovers (38-39).